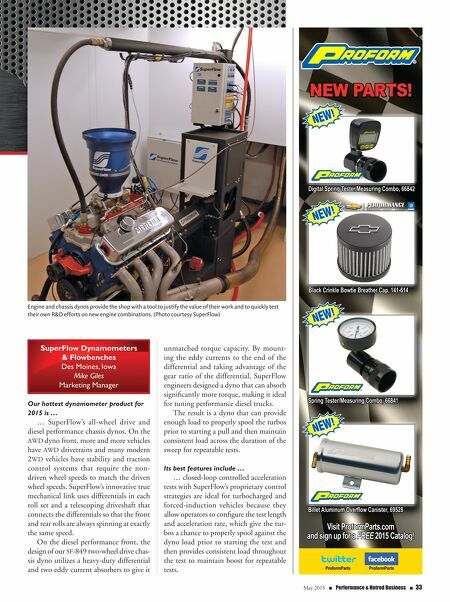 May 2015 n Performance & Hotrod Business n 33 SuperFlow Dynamometers & Flowbenches Des Moines, Iowa Mike Giles Marketing Manager Our hottest dynamometer product for 2015 is … … SuperFlow's all-wheel drive and diesel performance chassis dynos. On the AWD dyno front, more and more vehicles have AWD drivetrains and many modern 2WD vehicles have stability and traction control systems that require the non- driven wheel speeds to match the driven wheel speeds. SuperFlow's innovative true mechanical link uses differentials in each roll set and a telescoping driveshaft that connects the differentials so that the front and rear rolls are always spinning at exactly the same speed. On the diesel performance front, the design of our SF-849 two-wheel drive chas- sis dyno utilizes a heavy-duty differential and two eddy current absorbers to give it unmatched torque capacity. By mount- ing the eddy currents to the end of the differential and taking advantage of the gear ratio of the differential, SuperFlow engineers designed a dyno that can absorb significantly more torque, making it ideal for tuning performance diesel trucks. The result is a dyno that can provide enough load to properly spool the turbos prior to starting a pull and then maintain consistent load across the duration of the sweep for repeatable tests. 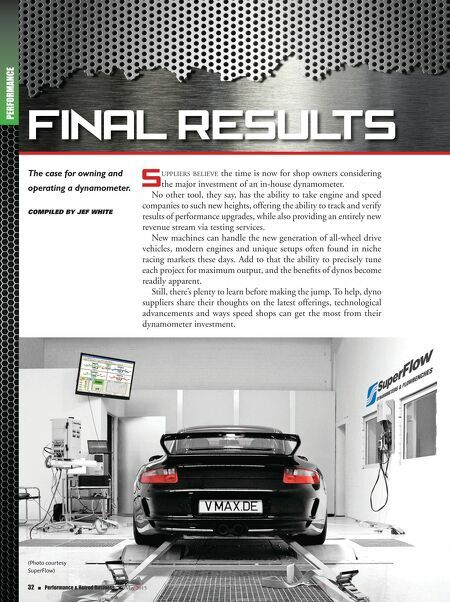 Its best features include … … closed-loop controlled acceleration tests with SuperFlow's proprietary control strategies are ideal for turbocharged and forced-induction vehicles because they allow operators to configure the test length and acceleration rate, which give the tur- bos a chance to properly spool against the dyno load prior to starting the test and then provides consistent load throughout the test to maintain boost for repeatable tests. Engine and chassis dynos provide the shop with a tool to justify the value of their work and to quickly test their own R&D efforts on new engine combinations. (Photo courtesy SuperFlow) Digital Spring Tester/Measuring Combo, 66842 Spring Tester/Measuring Combo, 66841 Black Crinkle Bowtie Breather Cap, 141-614 Billet Aluminum Overflow Canister, 69528 ProformParts ProformParts NEW PARTS! Visit ProformParts.com and sign up for a FREE 2015 Catalog!